Changes accelerated in Ancient Egypt in the 4th millennium BCE. 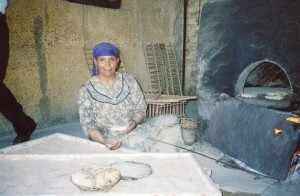 The Naqada cultures replaced the older Badarian and planted more of Egyptian civilization’s roots. The Naqada cultures flourished from 4000 to 3050 BCE. Egypt was unified into the culture school books tell you about between 2900 and 3000 BCE. So what the Naqada accomplished was as foundational for Western civilization as you can get. 1. Prominent elites emerged. A small percentage of burials were in well-furnished graves, rather than bare pits. The wealthier people used wooden coffins for the first time. The Afterlife was treated as a major investment as wealth grew. 2. Pottery became more diverse, and some ceramics had images of animals and humans. Ancient Egyptians in the dynastic periods developed this trend into some of the most realistic portrayals of humans and animals in the world. 3. A tomb painting in the ancient southern town of Hierakonpolis has 6 large boats, and some hunting scenes. Tomb painting became one of the most prominent art forms for ancient Egyptians, and the boat took on a lot of symbolic importance in ideas of the Afterlife and cosmology. 4. Faience figures appeared–little quartz-based blue and blue-green figures of animals began to be made, perhaps as amulets. This remained a popular art-form in Ancient Egypt. 5. Remnants of a royal compound were found in Hierakonpolis. A big open hall made from reeds presided on a large flat mound, and a fence surrounded a spacious yard around the mound. State-wide political gatherings and religious rites must have taken place there. 6. Royal burials were established in another southern town, north of Hierakonpolis, called Abydos. This was the main place for kingly burials before Memphis and Saqqara were founded. 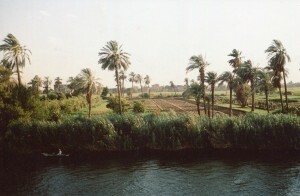 Ideas of connections between the state’s order and the king’s tomb must have first been established at Abydos. 7. A network of several towns all over the Nile emerged. 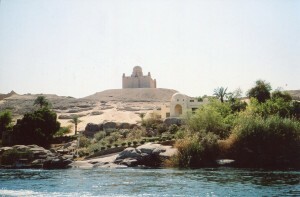 In the south, Hierakonpolis, Naqada and Abydos prospered. In the north, Buto and Ma’adi flourished. The northern towns traded with the Levant, procuring trees and oil. Hierakonpolis exchanged goods with Nubia in the south. All towns were linked in a commercial network, and they also traded with nomads in the Sahara and the Eastern Desert. Egypt was thus becoming culturally integrated, and in touch with the rest of the known world. People were sharing religious symbols and political ideas before the northern and southern lands were unified by 2900 BCE. Egyptians already showed a lot of concern for the Afterlife, but they also made well-proportioned art with human and animal figures. Their keen interests in spiritual matters, and love of this world and cheerful art were already blended. There has recently been a controversy: Were ancient Egyptians black or white? This question is a modern projection that obscures the richness of their cultural landscape. Ancient Egyptians did distinguish themselves from Nubians. They painted Nubians brown, and they colored their own men red, and made their women yellow. But Egyptians distinguished themselves from everyone else. They were arrogant–they thought they were superior to all other people. But people from all neighboring areas had been moving into the Nile Valley for thousands of years. Some Egyptians are dark and others are light. Some have straight hair, and others are curly. Ancient Egypt was a society of diverse people that developed a shared way of seeing reality–a unified world and a happy afterlife that reflects earthly prosperity. Consider me a convert! The proportioned and humanistic art that the West has taken pride in has some of its oldest roots along the Nile. People there developed ways of working together to manage its flooding for maximum crop growth for more than 1,000 years before the First Dynasty. Beyond the Nile Valley, it was nothing but desert. No forests to go meditating in, as ancient Indians had. Reality for ancient Egyptians was focused on the community and the here-and-now. They gave us some of the most life-affirming art in world history. I wondered whether I should categorize Ancient Egypt as African or Middle Eastern, and quickly realized that doing either would be inaccurate and unfair. Ancient Egypt was its own world. It was specific to the Nile and the system of religious symbols it developed. We’ll explore its glories in future posts. Also see Origins of Ancient Egypt. I love this picture. My first thguoht before I read the post was he’s made a drawing of the pyramid. I can’t believe this was a camera shot. My husband would love this because he wants to go to Egypt someday. Thanks for sharing. Have a nice night, what’s left.